Sen. John McCain speaks to the audience while talking with CBS Late Show host David Letterman during a taping in New York on Thursday. 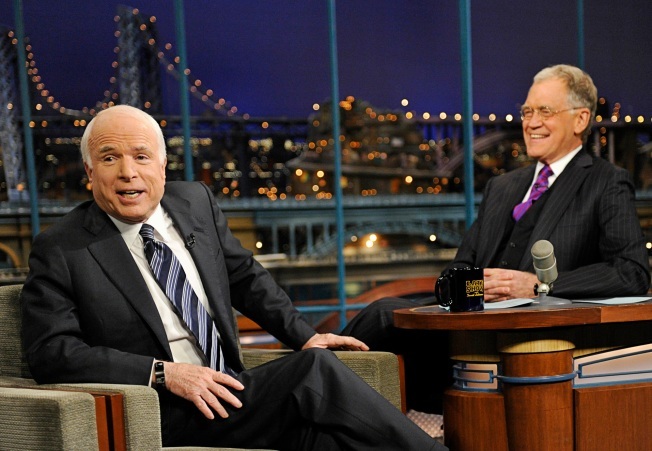 NEW YORK — John McCain paid a lighthearted visit to David Letterman on Thursday, joking: "I don't want to talk about the bleeping campaign." The former GOP presidential candidate also praised President-elect Barack Obama for some of his staff choices, including Secretary of State-designate Hillary Rodham Clinton, and shared Letterman's incredulousness at Illinois Gov. Rod Blagojevich. Letterman's "Late Show" was a land mine for McCain after the Arizona senator abruptly canceled a Sept. 24 appearance, saying he had to return to Washington to help with the nation's economic problems. Instead, he stopped by to see Katie Couric and Letterman mocked McCain mercilessly. McCain apologized three weeks later. "I don't want to talk about the bleeping campaign," McCain said with a smile. "Understand? If you think I'm going to go back to that bleeping situation, then bleep you." McCain said Clinton will bring "instant credibility, a certain amount of celebrity" when she travels around the world as the nation's top diplomat. "She is extremely knowledgeable on the issues," he said. "I think it's a good team and I think it's a very wise choice. And I would like to say that I think President-elect Obama has made a number of very wise choices which I think shows a centrist approach to government, which, obviously, the way America and the world is today, is necessary." 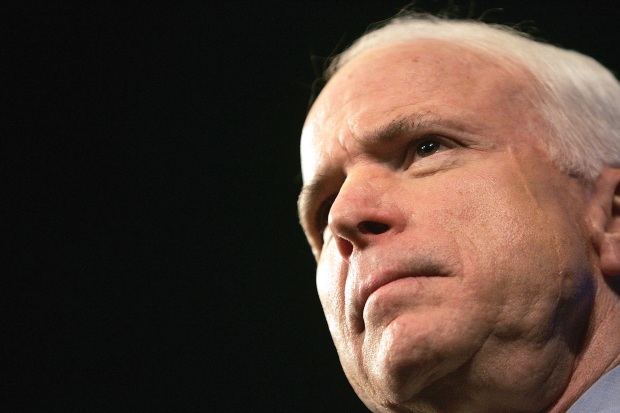 He still disagrees with Obama politically, but McCain said, "I applaud his selections." McCain said that Blagojevich, arrested and accused of trying to sell Obama's Illinois Senate seat to the highest bidder, once asked for a meeting and told McCain he was going to be a great reformer. "What do you think?" Letterman asked. "I think it's a rare combination of both," McCain replied. McCain also talked with Letterman about the times he crashed airplanes, and when he was shot down over North Vietnam and taken as a prisoner of war. He said there's a statue at the site in Hanoi where he was taken prisoner that says "26 on October 1967 the famous air pirate was shot down. John McCain was captured." "You know, you don't get a lot of statues," McCain said. "At least before you die."